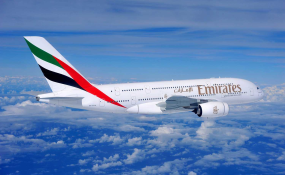 Starting from April, 2019, Emirates has started offering popular Nigerian films and music on its award-winning in-flight entertainment, ice which has of over 4,000 channels of on-demand. With a diverse mix of African and Nollywood films and music, Nigerian customers can fly comfortably while savoring a taste of home on every Emirates flight from either Lagos or Abuja. In the new package, customers can enjoy the highly celebrated Nollywood movie 'Lara and the beat' which was premiered in 2018. The movie starred leading Nollywood actors such as Seyi Shay, Vector, Somkele Iyamah, Wale Ojo, Sharon Ooja, Shaffy Bello and Uche Jombo, amongst others. They can also look forward to other movies from Nigeria and West Africa such as Mr. Not So Perfect, Ghanaian's Bad luck Joe, Azali, and My Very Ghanaian Wedding, and Cameroon's 'Ward Zee and a man for the weekend'. To create the ultimate ice playlist, the traveller can use the Emirates app, see what's playing on their flight, and create a playlist. On select Boeing 777s, the passengers can then pair with the seat back screen using onboard WiFi, follow the syncing process, and then sit back and enjoy their bespoke playlist. Tanzania: Diamond's Father Now a Musician!